// Today is a BIG day around here. I'm not sure who is more nervous....Todd and I or the kids! I take that back, Taylor is actually excited and not nervous at all, especially now that we've told her she's going to have a hamster for a class pet :) But the rest of us are just one big ball of nerves. I know that everything will be fine and that Carson and Taylor will both do great at their new schools today, but I still can't help but feel a little anxious inside as I leave them somewhere new for the first time. I mean can you even!?!? This was Carson and Taylor on his first day of Kindergarten just two years ago :( I mean, time please STOP....you're making my ovaries ache! // To change the subject (and avoid tears), we had a few friends over to grill out this past Saturday. Todd handled the steaks and chicken on the grill, while I made this yummy arugula salad and these roasted potatoes for the sides. Both were fairly easy and also super delicious. // I have received a lot of emails asking when the Lilly Pulitzer After Party Summer sale will begin, but sadly I have no idea. I have emailed a few contacts that I have with Lilly Pulitzer, but I have yet to receive an answer :( In past years, it normally starts today, so I am guessing that it will be very SOON!! I promise to let you guys know as soon as I find anything out!!! 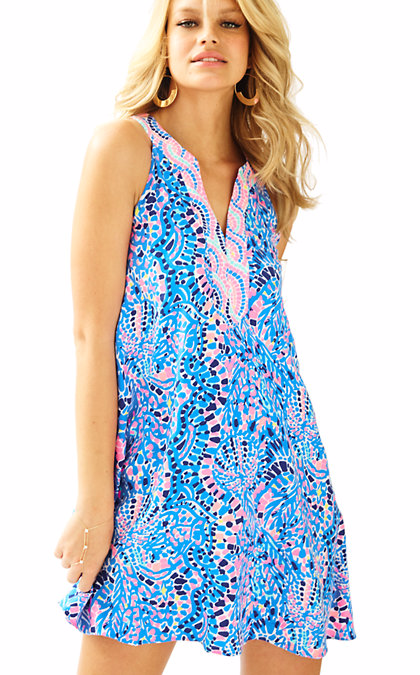 And speaking of Lilly Pulitzer, I am loving the New Arrivals! The dress below is definitely one of my favorites. You can use the MONDAYFUN to get free shipping on all orders today only! Jeans run really big so make you go down at least one size. I love those tanks! What kind of bra do you wear with them?